(Bloomberg View) -- With all the attention focused on the stock market drama last week, it’s understandable that new inflation data got lost in the shuffle. But let’s not forget that rising prices are what woke the bond market from its long slumber in the first place. Long before the wage inflation revealed by the jobs data for January was a meaningful concern, producer prices had been on a relentless march upward, hitting a recent six-year high. On a slightly more granular level, rising input prices pushed up the Journal of Commerce Index of 18 industrial commodities to a recent three-year high. The markets wasted no time pricing in what was to come. Perceived inflation risk, based on the market’s expectations for inflation over the next 10 years, rose along with the cost of raw materials. Markets got more evidence of inflation on Wednesday as data showed the consumer price index rose 0.5 percent in January, the most in five years. Pay close attention to inventories, a data set disregarded in placid market conditions and outright dismissed in turbulent times. After declining in October, wholesale inventories rose by 0.6 percent in November and were revised up to 0.4 percent from 0.2 percent in December. The revisions prompted the economists at Bank of America Merrill Lynch to revise up their estimate for economic growth in the last three months of 2017 to 2.7 percent from 2.6 percent. Looking ahead, this contribution to growth is likely just heating up. Given the pent-up demand implied by wholesale sales, chances are good the inventory build accelerated into this year’s first quarter, which could add appreciably to gross domestic product growth. Timelier anecdotal reports across a swath of industries back the news in the lagged inventories data. 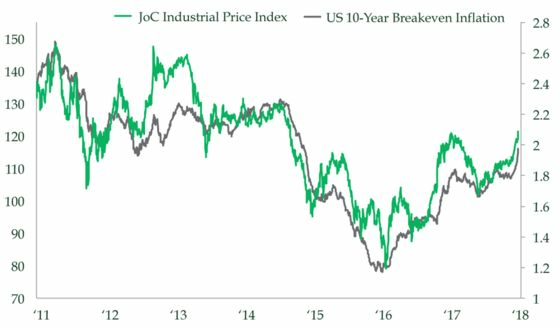 Reflecting widespread shortages, the January ISM report noted that Prices Paid component of its index rose to 72.7, the highest since May 2011. “The Business Survey Committee noted price increases continue in metals (steel, stainless, brass, aluminum, copper and scrap), intermediate chemicals, corrugate, crude oil, natural gas, various wood-based products and plastic resins,” the ISM report said. As for what is still building in the pipeline, at 59.1, supplier deliveries have not fallen back to the levels that preceded the hurricanes and wildfires that hit both coasts beginning last fall. That implies that bottlenecks have continued to gum up the supply chain. Not only does this complicate planning on factory floors, it necessitates price increases on suppliers’ parts. Margin squeezes naturally follow for their customers. One of the biggest contributing factors to depleted inventories and the resultant increased prices is a lack of transportation. The shortage of truckers has become an acute problem for suppliers and poses a material threat to the economy. The number of truckers, who move 70 percent of the nation’s freight by volume, has flat-lined over the past three years. Technological advances present several disincentives: Tracking truckers’ hours electronically inhibits their ability to work longer hours than laws permit, and constant news of self-driving vehicles discourages long-term career prospects. The upshot is a stunting of economic growth prospects as prohibitively high transportation costs force manufacturers to raise prices and shelf potential expansion plans. For the moment, at least in the case of small businesses, employers report that they are raising wages and prices. The latest National Federation of Independent Business survey revealed that current compensation had risen to its highest in 17 years. That has filtered through to higher selling prices, which rose to a July 2014 high. Such is the ebullience among small business owners that those saying it is a good time to expand their businesses soared to a record high in data that stretch back to 1973. The broad inventory indexes show that actual increases hit an 11-year high while plans to increase inventory continued to rise even as the number saying they expect higher sales declined in February. The push and pull continues. Severe supply chain disruptions collide with news of the Federal Reserve’s planned reduction of its balance sheet and the increased supply of Treasuries to finance rising deficits. At over $1 trillion, the planned supply of Treasury issuance is double what it was a year ago and is now the highest since 2010; it is expected to continue rising. In the wake of the January jobs report, few economists noted the shortened workweek largely offset the increase in hourly earnings. Perhaps the real culprit pressuring interest rates higher is the combined effect of constrained supplies, steeper input costs and the rising supply of Treasuries set to hit the market from two distinct sources. The real risk is that growth is thrown off course before wage gains have a chance to take hold.